You are currently browsing the Bookmobile News weblog archives for October, 2017. With the devastating wildfires displacing so many of our friends and neighbors, it was a privilege to put our rolling resource into action visiting the fire evacuation centers across Sonoma County. While many of the adults we encountered were hopeful about the condition of their homes, some already knew that they had lost everything. Our book-giving service was a small consolation in a disaster that will deeply change the region for years to come. But we were there to listen to their stories, and to offer an opportunity to relieve their stress and anxiety, at least for a while, by getting lost in a good book. Fortunately our appearances were especially helpful for the displaced children who did not have much else to do. On our tour we witnessed a tremendous outpouring of support from all corners of our community. Everywhere we went there were volunteers lined up to give whatever was needed, and stockpiles of crucial supplies coming in daily. What an inspiring demonstration of people helping each other directly! 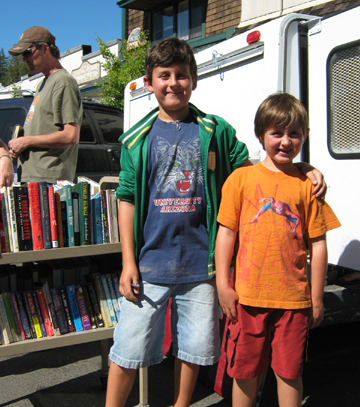 Peer-to-peer support is the foundation of the Free Bookmobile’s program model and it was on dramatic display here when the chips were down. For our part, we are now seeking out the neighborhoods and schools that are hosting families most affected by the fires, so we can prioritize them on our routes. Favorite books on the shelves are part of what makes a house a home, and we’re anxious to help people replace what they’ve lost. Oh yeah…we just passed 100,000 people served! And counting, as we continue to expand our routes and grow our impact throughout Sonoma County, especially reaching those who are most challenged for access to books: low-income and rural children, families and seniors. We have so many people and organizations to thank for getting us to where we are today, it wouldn’t be right to single out a few (though this news section is a good place to read about them). Just know, all of you, from the major foundation supporters to those who just gave a couple books, that a new generation is growing up around here with a special love for reading, and you helped make that happen. We know because we hear them squeal and run to our doors when we pull up to the curb. Some first experienced us as wee tikes — and now we serve them at their high schools!